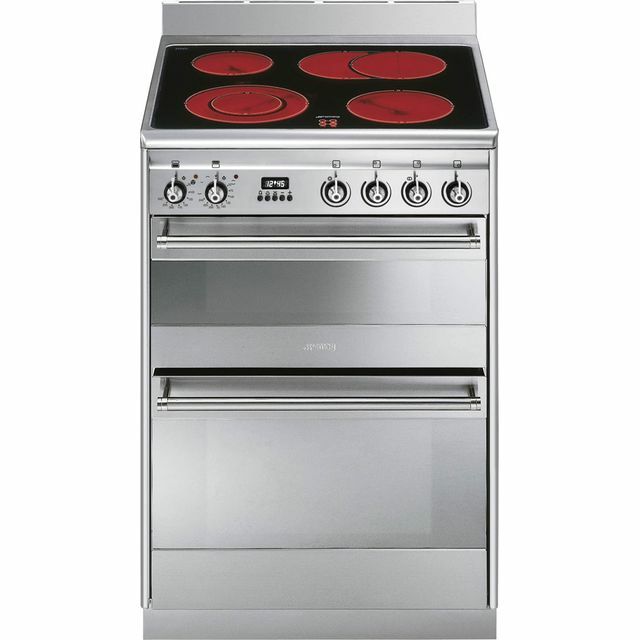 Cook all your favourites with this stainless steel dual fuel cooker from Smeg. You won’t even have to worry too much about your utility bills, as it’s been rated A for energy efficiency. If you’re fed up of burnt edges on your lasagne, the main electric fan oven is brilliant, as it circulates heat evenly to give thorough cooking results on every shelf. Every meal will always be perfectly cooked too, as you can set the electronic programmable timer to turn off when your food is ready. When the oven needs cleaning, you can pack away those marigolds as the enamel interior stops grease sticking inside, so it’ll just need a quick wipe. ... on the hob and I haven't been able to clean them off. The stainless steel and glass doors are a nightmare to clean. I've bought the recommended product but it makes no difference. The fan stays on for a very long time after the oven is switched off. That said, it's very pretty! We are really pleased with our new Smeg dual fuel cooker. 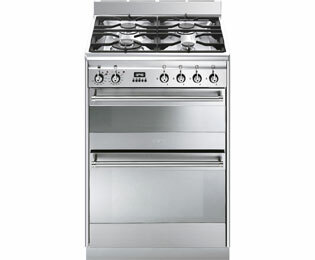 The build quality is far greater than our old cooker and looks like it will last for years to come. The reduction pan stands for small pans are really useful and are a good addition to the gas top. 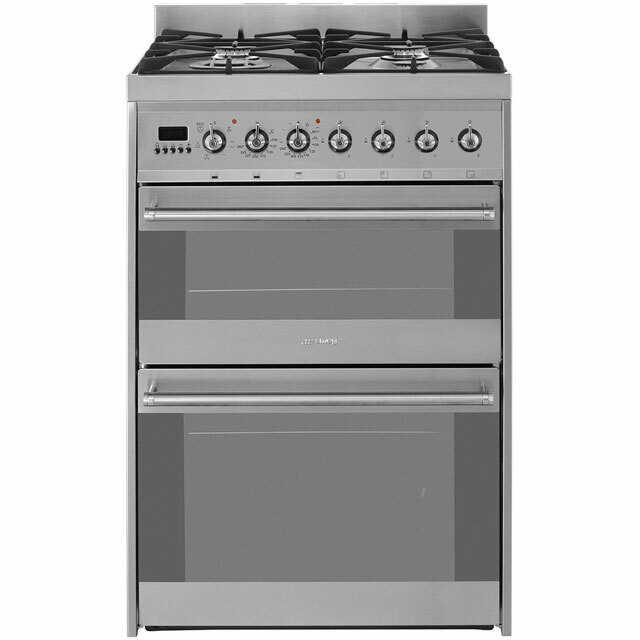 The gas hob controls are very precise and can be turned down to a simmer setting quite easily. The small stainless steel upstand at the back of the hob stops anything splashing or dropping down the back of the cooker and looks really neat against the wall. It would be useful to have an extra rack in the main fan oven instead of a grill tray. 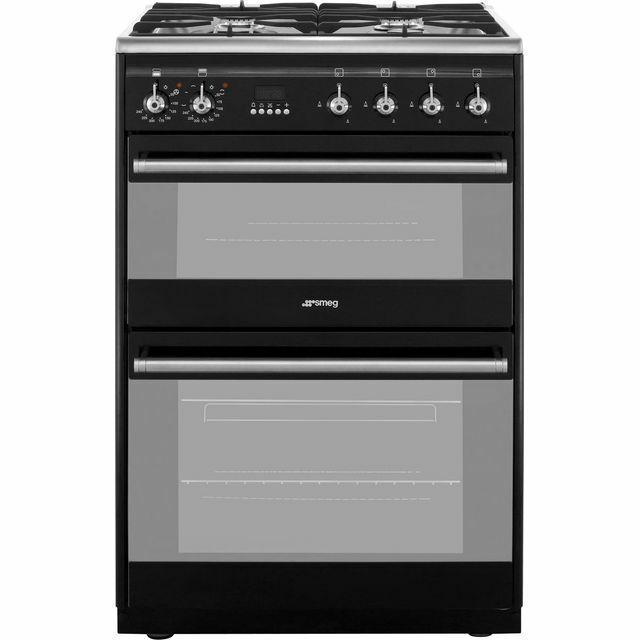 Overall we would recommend this smeg dual fuel oven. This is the first and last Smeg product I will ever own. 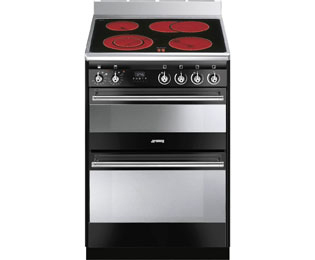 We bought this on the seemingly good build quality, no-fuss utilitarian looks and Smeg's reputation. Overall the build quality is very good, however the design is flawed to the point of impractical. We've experienced ridiculous amounts of steam and condensation from the cooker. The decals on the front have pretty much rubbed off (I have never used abrasive cleaning products). Either the steam or not opening the door sufficiently when using the grill has caused the 4 plastic buttons and the digital display to melt. Yes, we could be at fault but here should be a level of robustness in the design. This is a high-quality, low-energy, dual-fuel cooker. It is manufactured to a high specification and worth every penny. Installed correctly, there is no condensation build-up. wouldnt recommend this product as it creates far too much condensation and every time i opened the door i had a puddle on the floor. also, browning anything takes longer because of the excess moisture.